BRANDON – Several of Western Manitoba’s top athletes are training at the Healthy Living Centre (HLC), thanks to a partnership between Sport Manitoba and Brandon University (BU). The collaboration has resulted in the development of the High Performance Centre (HPC), where athletes have access to top-quality equipment and training. 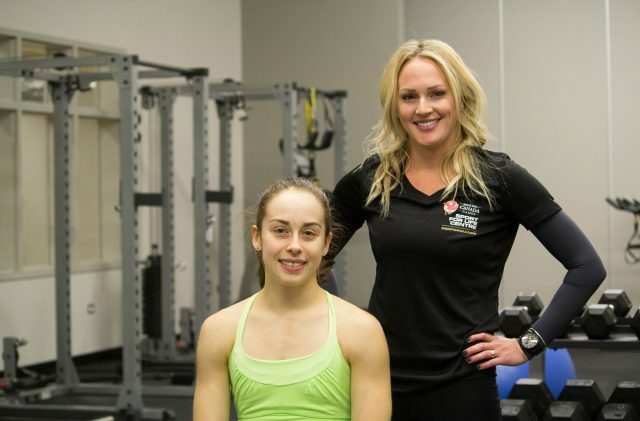 Used by national and provincial team athletes, as well as members of the BU Bobcats athletic teams, the HPC is Sport Manitoba’s first regional high-performance training centre. The addition of the HPC is another increase in services offered at the Healthy Living Centre. As BU spends the academic year commemorating 50 years since receiving its charter as a university, the HLC is marking a milestone of its own this year, celebrating its fifth anniversary. A series of special events are planned for January 8 – 12, 2018 as part of the celebration. Brittany Bruinooge, a Coach/Athlete Development Coordinator with Sport Manitoba provides a collection of services and mechanisms at the HPC, targeting athletes in the Learn to Train and Train to Train stages of Canada’s Long Term Athlete Development framework. Bruinooge works with the athletes to develop the mental, physical, technical and tactical requirements they need to achieve their desired performance outcomes. Among the athletes who train at the HPC is Isabela Onyshko, a Brandonite who has represented Canada internationally several times, including competing at the 2016 Summer Olympic Games in Rio de Janeiro, Brazil. Sport Manitoba is a not-for-profit organization and the lead planning, programming, and funding agency for the development of amateur sport in Manitoba. Located in the Canada Games Sport for Life Centre, Sport Manitoba partners with over 100 organizations to deliver sport in our province and is responsible for programs including the Manitoba Games, Coaching Manitoba, Team Manitoba, Manitoba Sports Hall of Fame, Fit Kids Healthy Kids and KidSport. Services provided include the Sport Medicine Clinic, Fitness Centre, Performance Centre, and the Paul Robson Resource Centre for Leadership and Coaching.